Daniel Liss has yet to start college, but already he’s getting some hands-on research experience at NASA. This summer, Daniel is designing computer simulations of variability in the Crab Nebula with his mentor, Dr. Elizabeth Hays. “For many years, scientists thought that [the Crab Nebula] was a constant source of gamma rays in the sky,” explains Daniel, “and over the past few years we’ve actually learned that it’s changing very rapidly.” Daniel attempts to model these changes in his simulations. Credit: NASA/Daniel Liss. 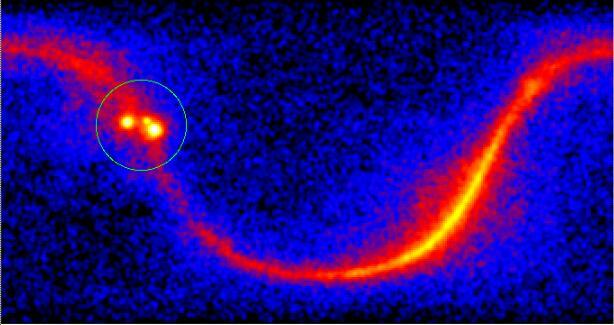 Daniel’s simulation shows selected sources in the gamma ray sky. Circled are the Crab Nebula, IC 443, and Geminga. This is not Daniel’s first Goddard internship. After graduating from high school in February, Daniel worked with Dr. David Leisawitz in the Interferometry Laboratory. Daniel learned about Dr. Leisawitz when he was doing research for a holography science project he presented at the Intel International Science and Engineering Fair in 2011. (“Holography” is just what it sounds like – the study of holograms!) After working with interferometers, Dr. Leisawitz recommended Daniel for his current internship position. Credit: I-SWEEEP. 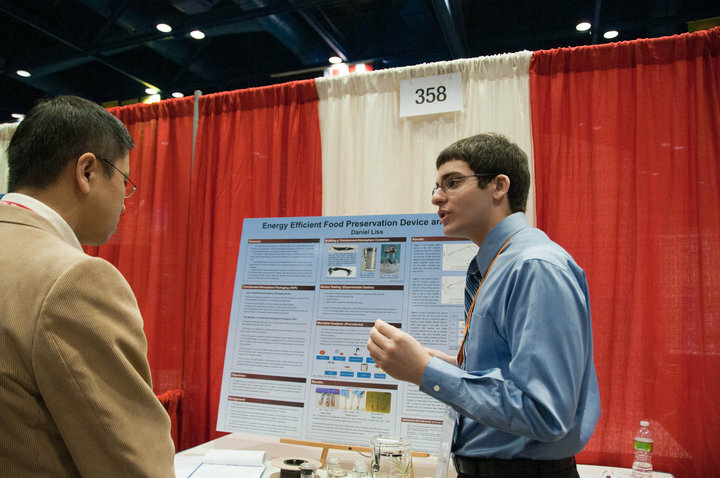 Daniel presents research at an international science competition. What’s next for this bright, young student? Daniel will attend Columbia University in the fall, where he plans to study computer science. He’s been programming since the age of eight, and is excited to be able to study something he’s always done for fun. Columbia is also a block away from the Goddard Institute in New York, so perhaps Daniel will continue his relationship with NASA. We sure hope so, because students like Daniel will be instrumental to our future! Previous Previous post: Meet Elizabeth Toller! Next Next post: Meet Laura Dunlap!